Years ago, when we took our American cousins for pizza in Mumbai, they were quite stumped by the Udupi pizza, a plump circle of dough, tomato sauce, capsicum-onions-tomatoes, and oodles of Amul cheese grated on top. The younger cousin politely asked the server for his cheese to be melted. The bemused server insisted that this was melted. We finally moved dinner to Pizzeria in Churchgate, where they happily noted the stringy, gooey cheese and nodded their satisfaction. I was listening to the BBC Food podcast recently where I discovered the difference between Neapolitan pizza and the Sicilian one. The first one has few ingredients, thin crust that almost folds over while eating, while the Sicilian one is thicker with lots of toppings. Of course, they didn’t include our homegrown Udupi pizza in it. But, there’s something about handmade dough, fresh tomato sauce and mozzarella cheese baked in a wood-fired oven. Once you’ve tried that pizza, it’s impossible to eat those hyper-processed pizzas that are over salted with cardboard-like dough and cheese that tastes of nothing. 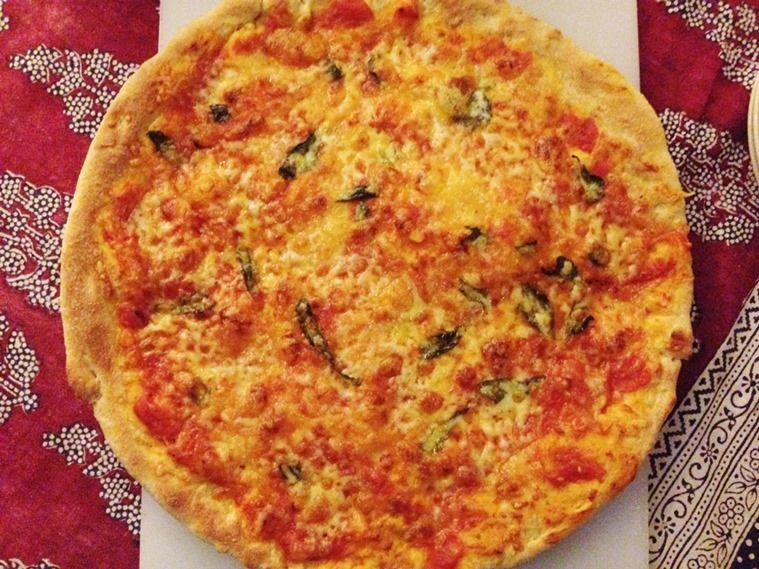 Homemade pizza, for most of us, is buying readymade bases from the shop and baking it with tomato puree and cheese. Almost a year ago, my British friend Deborah taught me how to make pizza from scratch. The dough recipe comes from one of my favourite chefs ever – Jamie Oliver. And then we tinkered around with different toppings. This pizza is so easy that it’s become a weekend staple at my home. I usually substitute most of the maida for whole wheat flour, and so far, no one has been the wiser. Also, my oven conked in the middle (THE HORRORS) of all this baking and as a 13-year-old told me, this pizza bakes perfectly well in the air fryer. And it does. Method * You can warm the water in the microwave or stove for 10 seconds. It needs to be lukewarm, not hot. * Add yeast and sugar and mix vigorously with a fork. Leave it aside for a few minutes. Listen to the yeast – if it makes a humming sound, you know it’s active. * Most active dry yeasts in India that you find in retail stores aren’t that effective. Look for the ones with small granules or get fresh yeast, which you can then store in the freezer. * Mix flour and salt and make a well in the centre. Add the yeast water mixture and use a fork to mix it into the flour. * Once it starts to come together, tip the batter onto a floured surface and start kneading the dough. * There’s a trick to pizza dough – you need to push the dough away from you with one one hand, and at the same time, stretch it towards you with the other hand. Keep doing this for 10 minutes – I set a timer – until you get a smooth dough. It looks messy but don’t be tempted to add too much flour to the dough. * Grease a bowl with olive oil and put the dough inside it. Drizzle some olive oil on top as well. Cover with a kitchen towel and let it sit for 45 minutes. The dough should double in size. To make the pizza pies * What I usually do is follow Jamie Oliver’s instructions. So I cut the dough in half and wrap half of it in cling wrap and stick it in the freezer to use for another day. * The other half, I divide into four balls, dust them and cover them in plastic and let them sit for 15 minutes. * Roll out some of the dough until it’s 0.5cm thick. You can do it on your kitchen platform, or if you’re making mini pizzas then on your rolling board. * Dust parchment paper with rava, and put the rolled pizza dough on it. Brush it with olive oil. * When it comes to toppings, I like to stay Neapolitan – the lesser the better. For tomato sauce * Heat 1 tsp olive oil in a pan, add ajwain, crushed garlic, basil leaves, chilli flakes, salt and chopped tomatoes and sauté. * I use the paav bhaji crushing tool to mash this into a sauce. I am not a big fan of dried oregano, so I add caraway seeds or ajwain instead – they taste quite similar. For Pesto sauce * In a blender, blitz basil leaves, walnuts, salt, pepper, and garlic cloves. * Add parmesan and olive oil and mix. Putting the pizza pie together * Once your dough is rolled out and ready, spread the tomato sauce on top or pesto, right until the edges. If you’re using pesto, then sauté some 3-4 cloves of garlic in oil, cut them into small pieces and stud the pizza base with the garlic pieces. * If you’re using tomato sauce, add slices of mozzarella cheese and basil leaves. * Drizzle with some olive oil and salt. * Place in the oven to bake. * These pizzas cook in a hot oven – 250 degrees C/ 500 degrees F in seven to 10 minutes.